This Saturday, 10th March, marks the 113th anniversary of the founding of Chelsea Football Club. To mark the occasion, Chelsea Supporters Trust has organised a guided tour of Chelsea F.C. related graves with club historian Rick Glanvill, followed by wreath laying at the Mears family memorial. The tour is open to all Chelsea Supporters Trust members. If you’re not already a member, please take a look at our Membership page to find our more about which levels of memberships are available or sign up on the day. If you’d like to attend, please meet at the Visitors Centre at 12.15pm (this is located near the West Brompton station end of the cemetery). If you’re not able to join us on Saturday, you can download your own walking guide of the Chelsea F.C. related graved located in Brompton Cemetery from the Official Website. 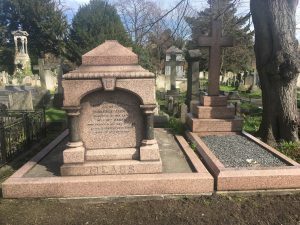 Chelsea Supporters Trust also organises regular visits to the cemetery to maintain the Chelsea graves – information about when these take place are posted on Twitter and Facebook, so make sure you follow us if you’re interested!